I once owned a charm bracelet. I think my Aunt Ginny gave it to me. It was silver and had a few charms. The only charm I remember is a Christmas tree, but I probably had 4 or 5 charms on it. It was lost when my jewelry box was stolen when we lived in Pittsburgh. I must have worn it in front of Jeremy, because he sent me a charm from Germany. I still have it — mostly because of the note on the back. 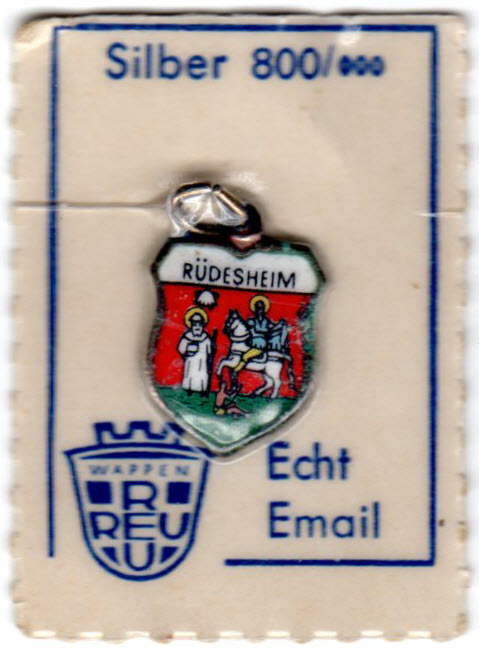 I don’t speak or read German but Professor Google tells me that Echt Email can mean either “Authentic e-mail” or “Authentic enamel.” Since I got this in the 1970s, I will assume it means the latter.